Tammy and Tad had a gorgeous wedding at the Prado in Balboa Park, San Diego, CA. Tammy loves Anthropologie and was inspired by the store as she dreamed up her decor. 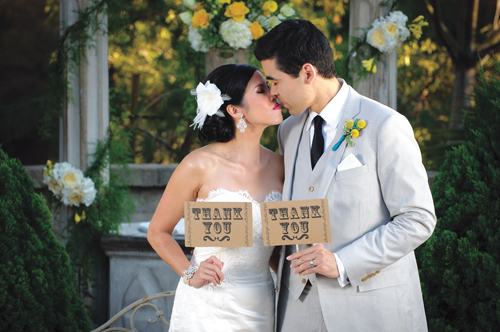 She added creative, eclectic, personal touches to showcase her own sweet whimsical style (check out the teal shoes!) and to tie in her and Tad’s mix of Thai, Chinese, and Japanese traditions. Tammy commissioned her nurses in her office to assist her with making 1000 origami cranes that we hung in strings from the Prado’s balcony. It’s a cultural tradition for Japanese brides to make 1000 paper cranes for their wedding day to represent their hope for a happy marriage. 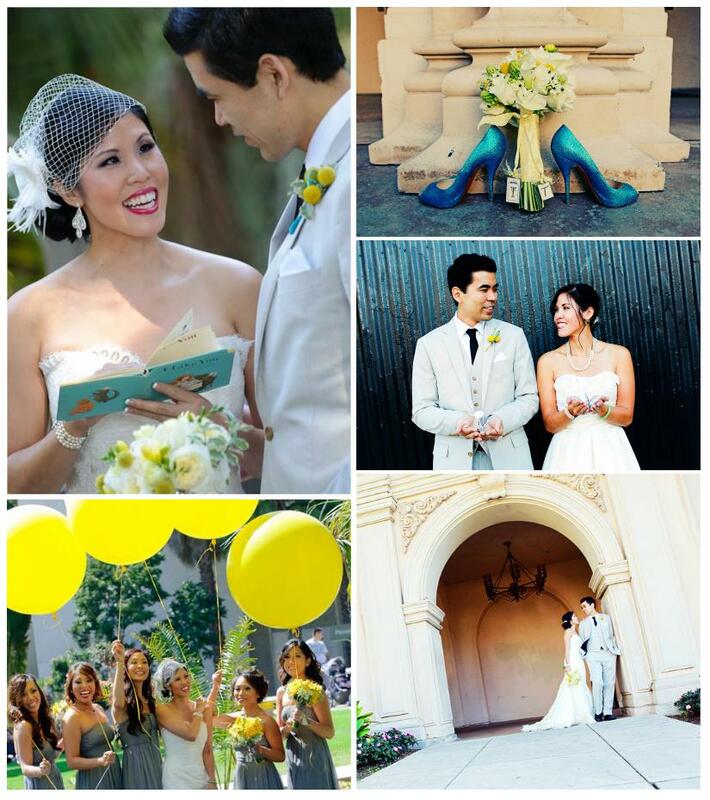 The bridesmaids attire consisted of gray dresses, teal shoes, yellow bouquets…and these fantastic yellow balloons! Tammy loved this idea and had the balloons delivered to the Prado as a perfect prop for some of her photos. The wedding began with a traditional American ceremony (where Tammy wore a gorgeous white gown with teal shoes) and then proceeded to a Thai ceremony, known as a sinsod (which of course included an outfit change! ), in which the couple are interlinked by their elders and community. For the Japanese side, Tammy (and her nurses) made 1000 origami cranes that were used as seating cards and which we strung from the balcony during the cocktail hour. She added Japanese tea tins to further incorporate a little Japanese culture in a nostalgic way. Tammy wanted a whimsical garden feel to her decor so we focused on bird cages, natural wood, and lots of candles to create natural light. Check out the bird bath cake table that Chris, from Indulge Flowers created! I am now completely over standard cake tables. The bird bath was amazing! 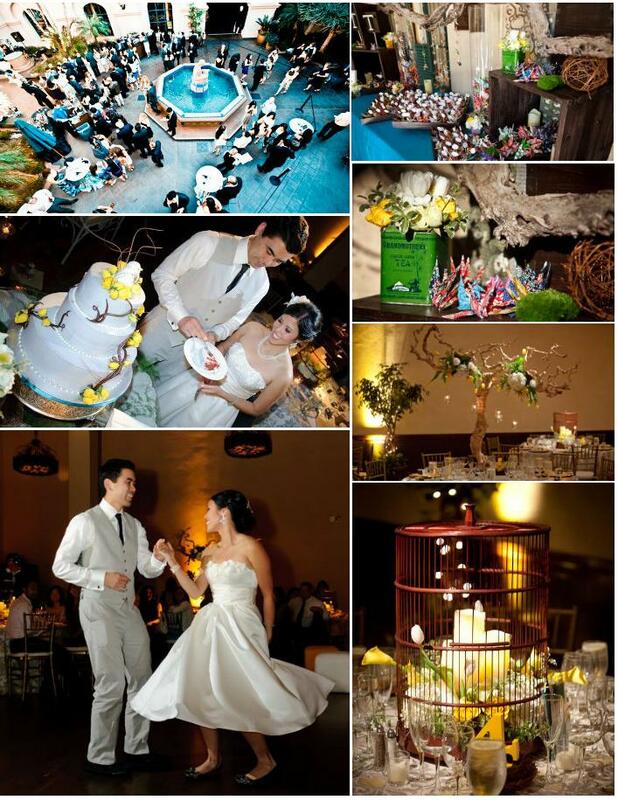 The centerpieces were a mixture of bird cages, wood lanterns, and these amazing ginormous trees! During the reception, Tammy & Tad further honored Tammy’s Chinese side by doing a traditional Chinese tea ceremony. The newlyweds served green tea to their primary family (which involved another outfit change!). At this point Tammy had, yes, count them, three dresses (each of them unique and gorgeous on their own). And then she added a fourth! Tammy finished the evening in a tea-length 50’s style dress which perfectly accented her and Tad’s choreographed swing “first dance.” We heart Tammy & Tad and are so inspired by Tammy’s love for nostalgic details and whimsical touches!